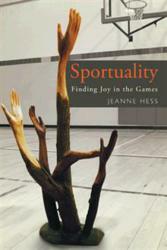 Longtime coach Jeanne Hess, author of the new book “Sportuality: Finding Joy in the Games” (published by Balboa Press), redefines words traditionally used in sports to help the reader find greater meaning and purpose as a player, coach, fan, official or parent. “Sportuality,” Hess believes, provides a vehicle for introspection about sports and athletics; it helps readers move toward greater consciousness around competition, and to move beyond dualism toward peace and joy. “Using a journal and questions for self-reflection – called a “box score” and “time-out” – readers can reflect upon and create their own sportual stories,” Hess says. She further explains that by examining words traditionally used within sports, “Sportuality” helps the reader think critically about competition, community, communication, spirit, humor, enthusiasm, education, religion, holiness, sanctuary, sacrifice and victory. Raised as a dualistic Catholic-Episcopalian, Hess embraces the universal nature of Catholicism, defining all people as God’s children united in spirit. She lives in Kalamazoo, Michigan, with her husband, Jim, whom she met in a gym. Their lives have been defined, shaped, and enhanced by several different gyms and athletic arenas.